LIMA (Reuters) - Peru's presidential front-runner Keiko Fujimori has hired former New York City Mayor Rudy Giuliani as an adviser, trying to bolster her law-and-order credentials without relying on the image of her divisive father, jailed former President Alberto Fujimori. Giuliani, whose tough and popular police tactics were credited for cutting crime and who cast himself as a global expert on terrorism after the September 11 attacks, will help Fujimori's campaign design public safety programs. 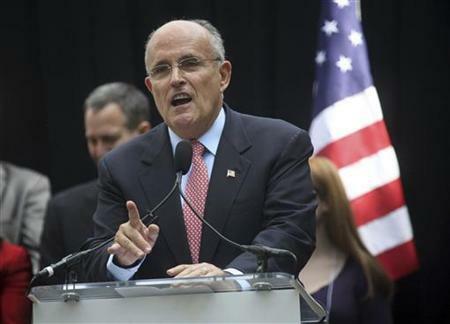 "He has a great record of fighting delinquency, so I think his presence here is helpful to strengthen our proposals," the 35-year-old candidate said of Giuliani on Monday. Her announcement comes after weeks in which analysts said she needed to distance herself from her father, jailed former President Alberto Fujimori who ruled Peru with an iron fist in the 1990s, if she hoped to woo moderate voters in the tight race for the June 5 election. After staunchly defending her father for years, Fujimori last month apologized for the first time for what she called the excesses of his authoritarian rule, during which she served as first lady after he separated from her mother. Pollsters say those comments have helped her move slightly ahead of left-wing Ollanta Humala in opinion polls. Public safety is a top concern of voters, according to the polls. The elder Fujimori won praise for ending hyperinflation and a long-running fight against rebels that killed nearly 70,000 people. But he was later convicted of corruption and trampling on human rights in a dirty counterinsurgency campaign. Keiko Fujimori indicated Giuliani will mainly help with programs combating urban crime, though Peru faces broad security risks. Peru has seen a rise in violent crime in recent years that local police say is related at least in part to drug trafficking. The country is the top global producer of coca leaf used to make cocaine. The government is also trying to catch two remnant bands of Shining Path rebels who went into the cocaine business after their leaders were captured in the 1990s by the elder Fujimori's security forces. Despite her denials, critics fear she would unilaterally try to free her father from jail if elected. They also say much of her campaign team is comprised of former aides to her father's government. The younger Fujimori appeals to a narrow voting base that strongly defends her father, along with the business elite who remembers her father for opening the economy to trade. In the last week, she has risen in polls as moderate voters shy away from Humala, who many fear might roll back years of free-market reforms in the surging economy. Humala, a former army officer who led a short-lived revolt against Fujimori's father, campaigns as a moderate leftist but he spooks investors with his more nationalist policy platform that outlines an interventionist agenda for the economy.